“The European Union has been particularly tough on the U.S. they make it almost impossible for us to do business with them,” Trump said. “The trade war hurts them it doesn’t hurt us,” he added. The European Union, of which Sweden is a member, has been the only entity to announce potential retaliation to the tariffs, as EU Commissioner for Trade Cecelia Malmstrom said U.S. exports to Europe — like bourbon and jeans — could face a 25 percent tax. 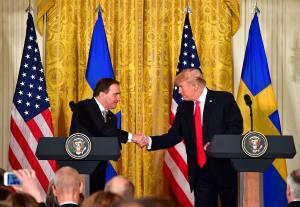 Löfven said it is “critically important” to have free trade and find a way for the United States and EU to cooperate. “For me leading a small country, depending on open trade, the best way for us is to do that with others,” he said. Despite possible tension regarding the proposed tariffs Trump hailed Sweden as one of the United States’ “oldest and closest partners” and thanked the country for assisting in the release of Otto Warmbier, who was detained in North Korea. Prior to the conference Trump said he’d “like to be optimistic” about engaging in negotiations with North Korea regarding its nuclear weapons program. “We’re in very close contact. We have come, certainly, a long way, at least rhetorically, with North Korea. It would be a great thing for the world. It would be a great thing for North Korea. It would be a great thing for the Peninsula,” he said. Löfven emphasized the importance of opening a dialogue with North Korea to mitigate the “very dangerous situation.” He said Sweden, which has an embassy in Pyongyang, is willing to help the United States and other “key actors” in negotiations. “I believe that they trust us. We are a military non-aligned country and I think if the president and the key actors decide they want us to help out we’ll be there,” he said. Trump praised Sweden for being “terrific” in its interactions with North Korea before joking he was responsible for North Korea’s recent willingness to negotiate. He added he believes “strong” and “biting” sanctions being enforced with assistance from China have been a factor. “I like conflict, I like people with two points of view,” he said. Discussing upcoming elections in both the United States and Sweden in the wake of alleged Russian tampering, Trump suggested implementing a paper backup voting system and promised to “very strongly” counter any influence. “We’re doing a very deep study and coming out with strong suggestions in the 18 election,” he said.